English Mastiff socialization is a must if you want these dogs to become fully integrated family members. We bought an English Mastiff from a lady who was raising her with three other Mastiffs. They were in very poor living conditions and Gabby looked extremely malnourished. Since we brought her home we have been feeding her twice a day, wet and dry food, and she has a nice bed in our garage with two heaters. Gabby seems to be getting very irritable towards our female Rottweiler lately and attacks her often. I don't know what to do. I will take her to the vet soon, however, I have no records from her last visit. The previous owner did not provide them. Is it common for these dogs to become irritable towards other dogs? She looks like a skeleton. It makes me sad. I'm so sorry to hear about the conditions your new pet was living in before she came to you, although I am very glad you saved her. From what you say, I'm betting there are no previous health records because the previous owner never took her to the vet's in the first place. The best you can do is call the person who you bought your dog from and ask for her vet's name to try to get some records yourself. If there aren't any, your vet may want to carry out vaccinations on your dog. Since you'll be addressing Gabby's condition with the vet, let's move on to the behavioral issues. 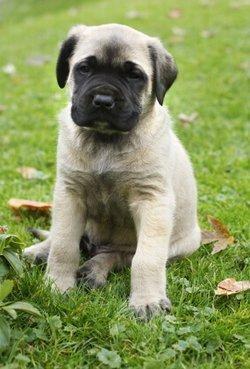 Mastiffs need a great deal of socialization and proper training as puppies in order to make them good canine citizens when they grow up. Otherwise you can wind up with a 150 pound Attila the Hun on your hands. As soon as you get a clean bill of health on your dog, enroll her in a socialization class at your closest dog training facility. Once she graduates, move on to obedience training. As for her interactions with your Rotty, Gabby is probably feeling very vulnerable right now in addition to not being in good physical shape. I suggest that you spend some concentrated time introducing the two of them and working with them very closely to assure both dogs that everything is alright. This, coupled with the socialization and training should move your family pack in the right direction.